Medical tourism is currently a catch-all phrase to describe any form of travel across borders for the purpose of receiving medical treatment. Up to this point in time, there have basically been only two kinds; patients from developing countries seeking advanced medical care unavailable in their homeland and patients from developed countries seeking lower prices or faster attention for their medical care. Although these two groups have been growing exponentially in recent years and pose substantial challenges on their own, little attention has been paid to a third arm of the medical tourism industry which potentially may have greater ramifications for the future. There is an emerging class of on-line entrepreneurs who may take advantage of their choice of lifestyle to enhance the range of choices in their medical treatment, and this group should be recognized. 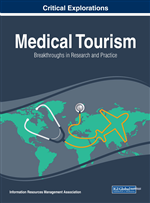 This chapter discusses the demands and challenges this new arm of medical tourism may pose for public policy, medical financing and medical practice. Medical tourism is currently a catch-all phrase to describe any form of travel across borders for the purpose of receiving medical treatment. Up to this point in time, there have basically been only two kinds; patients from developing countries seeking advanced medical care unavailable in their homeland and patients from developed countries seeking lower prices for their medical care. Although these two groups have been growing exponentially in recent years and pose substantial challenges on their own, little attention has been paid to a third arm of the medical tourism industry which potentially may have greater ramifications for the future. This chapter discusses, as an example of this change, how differences in the medical cost structure and government regulation between two developed nations, Japan and the United States, have created logistic pathways for the treatment of well differentiated thyroid carcinoma that are equally efficacious but are specifically suited to each environment. What these differences mean for medical tourism is explored – one of the main outcomes is how an emerging class of on-line entrepreneurs may take advantage of their choice of lifestyle to enhance the range of choices in their medical treatment. Finally, the demands and challenges this new arm of medical tourism may pose to public policy, medical financing and medical practice are outlined. There is a vast difference in the cost of medicine between the US and Japan. Although the cost of living in the two countries is roughly equivalent, medical fees in the United States are typically about five to ten times as much at the cashier counter as that of the same treatment in Japan, that is administered with equal or greater competence. Even when indirect costs such as government subsidies paid to public hospitals are taken into account, the cost per capita in Japan is half that of the US (OECD, 2013). The low cost of Japanese healthcare derives from the fact that the Japanese government sets the price for every medical procedure, and patient reimbursement is decided with little or no consideration of the actual market value of the treatment, or the difficulty of the procedure. Under such conditions, Japanese medical providers can opt to supply treatment options that are impractical or prohibitively expensive in the US. Medical consumers, on the other hand, cannot easily take advantage of the price difference. For example, one surgical treatment choice may require a certain kind of post-surgical follow-up plan, while another may require a completely different kind of post-surgical follow-up. The importance of this lies not only in the wider range of procedures that may be available, but also in the likelihood that a patient cannot easily choose to travel to Japan to receive surgery if the required follow-up is unaffordable back home. Because medical costs are so low, the Japanese medical provider and the consumer can opt for a more labor intensive follow-up at much less cost as long as this is taken advantage of while in Japan. In fact, the Government mandated cost structure of surgical procedures forces the Japanese medical provider to provide exactly the wellness outcome that the medical tourist seeks in addition to surgery, because a less labor intensive follow-up will not produce enough revenue to keep the provider in business. Consequently, the initial treatment can be more conservative, and/or wide ranging. For inverse reasons, the initial treatment in the US tends to be more radical. There are legitimate pros and cons to conservative surgery and radical surgery. But when one cost group is heavily constrained towards one side and another cost group is heavily constrained to the other, it seems quite clear that the line between them is drawn on cost grounds. If doctors chose their treatments based only on their differing opinions on what would serve the patient best, the choice of treatments should be more mixed in both countries. In either case, the stationary medical consumer does not have a choice in the treatment. An American hoping to receive the conservative treatment available in Japan who cannot remain for long enough to take advantage of the equally cheap post-operative follow up would have to return to Japan regularly for this. Then, the cost of travel may cancel out the economic advantages of the initial procedure. The medical consumer who can most take advantage of this particular situation is thus not the traditional short-stay “tourist” who flies in for treatment and flies back home immediately afterward, but the “nomad” who can work anywhere in the world or who have no need to return home as soon as their sick leave expires.